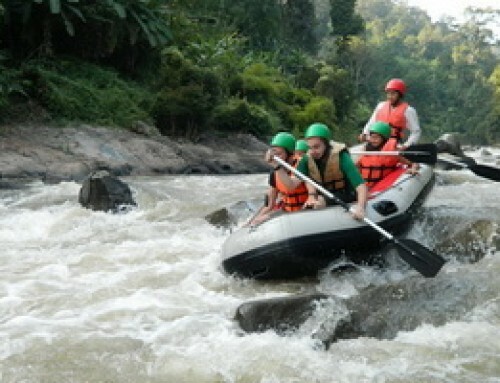 Chiang Mai Rafting at Maetang River, runs north of Chiangmai and offers the full spectrum of emotion. The journey begins at the narrow point of the river with level 4 & 5 white-knuckled, wide-eyes, tumultuous rapids. This river and its canyons offer a truly adrenaline pumping rush down the rapids. Our safety staff are from the river villages and are intimate with its character. They are all trained in safety & rescue procedure from both raft and shore. Our team is with you both on & off shore, as the river parallels the road. In our 12 years in business we have been without a safety incident. This is not luck, but a passionate commitment to our safety philosophy. Your responsibility is to have as much fun, excitement & adrenaline rush as possible… Our responsibility is assuring you return next year for more! Scenic 80 km trip to river site. Hot lunch and Q & A, raft run of level 4+ thru 10 km.of breathtaking white water. 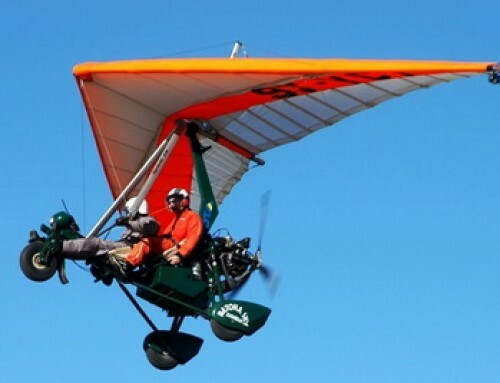 09:30 – 11:30 a.m. Go to Ampure Maetang about 60 km. from town arrive at base camp and change to Pickup truck to upper camp about 10 km. 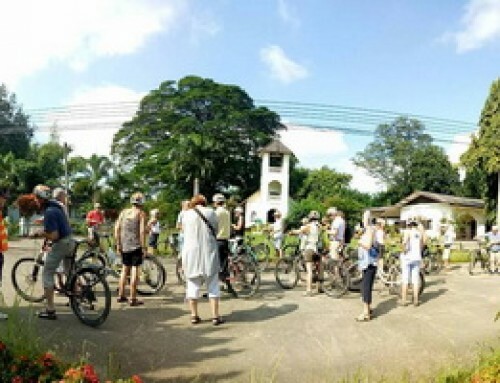 On the way we will stop by at elephant camp for people who buy package for elephant riding about 45 min. At upper camp we will have lunch together and then brief, Practice on ground put on helmet and life jacket then practice in the river 1 more time Then start rafting for 1-2 hrs. up to the rapid of the river. The Elephant Retirement Park offers a rare opportunity to spend a half day with these majestic elephants. You will witness their behavior in the elephant natural habitat along with having an up close and personal experience. Time for lunch, our lunch is a traditional Thai buffet, which is suitable for vegetarians. After lunch, Raft run of level 4+ thru 10 km. of breathtaking white water. The journey begins at the narrow point of the river with level 4 & 5 white-knuckled, wide-eyes, tumultuous rapids. 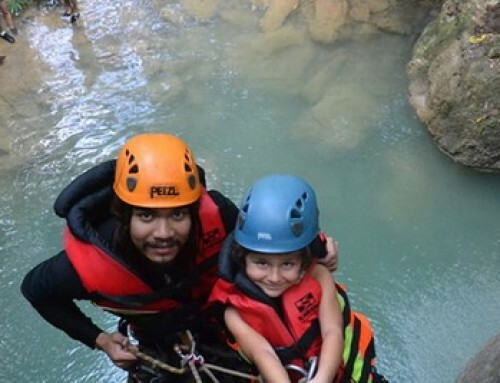 This river and its canyons offer a truly adrenaline pumping rush down the rapids. Our safety staff are from the river villages and are intimate with its character. They are all trained in safety & rescue procedure from both raft and shore. 10:00 – 10:30 a.m. Change your cloth to the local clothes for play mud spa and bathing with the elephant at the elephant pool. After we finish the mud spa, it’s time to relax, take a shower and enjoy the beautiful scenery with the coffee and tea. Scenic 80 km trip to river site. Chilling around the camp for an hour while waiting for those who ride elephant. Providing lunch & drink water, Q&A, raft run of level 3-4+ thru 10 km(2-3 hours, depend on season). 2 pm. 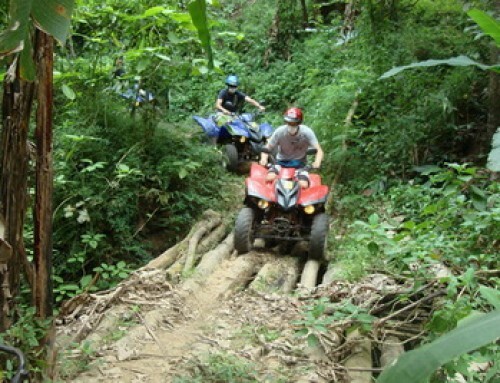 At ChiangMai Beach pick up your ATV for a memorable 1 hour of bumps, mud, hills, rocks and creek beds thru our rainforest on paths. The Elephant Retirement Park offers a rare opportunity to spend a half day with these majestic elephants. You will witness their behavior in the elephant natural habitat along with having an up close and personal experience. Time for a traditional Thai buffet lunch, which is suitable for vegetarians. After that brief for the ATV and start Trip ATV 1 hours Bushwacker Tour. 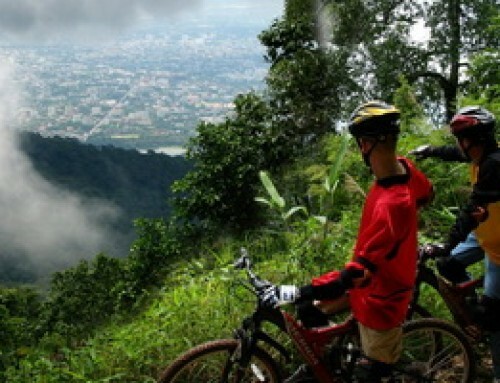 Explore the mountain and panoramic view at Mae Taeng area lead by our expert guides. Next, Start rafting run of level 3-4+ thru 10 km. (2-3 hours, depend on season). The journey begins at the narrow point of the river with level 4 & 5 white-knuckled, wide-eyes, tumultuous rapids. This river and its canyons offer a truly adrenaline pumping rush down the rapids. Our safety staff are from the river villages and are intimate with its character. They are all trained in safety & rescue procedure from both raft and shore. 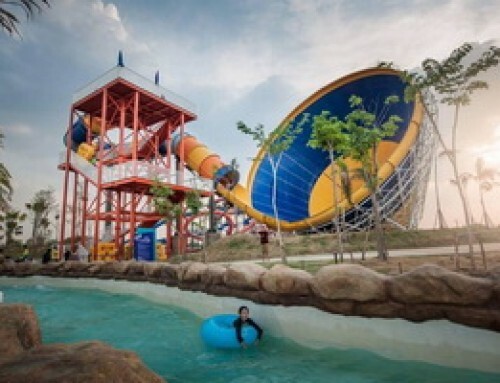 10:00 – 10:15 a.m. Change your cloth to the local clothes for play mud spa and bathing with the elephant at elephant pool. After we finish the mud spa, it’s time for relax, take a shower and enjoy the beautiful scenery with the coffee and tea. 02:45 – 03:00 p.m. Finish ATV 1 hour. Take 30 minute to White Water Rafting Camp. 03:00 – 03:30 p.m. Arrive White Water Rafting Camp. Briefing for safety, how to paddle and so on.